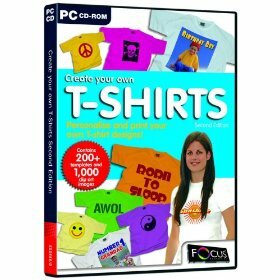 The fast, fun and easy way to create your own T-shirts! Containing over 200 ready to use templates and 1,000 full colour clip art images, Create your own T-Shirts is ideal for creating personalised clothing for yourself, or as gifts for family and friends. Create your own designs or use one of the customisable templates - or for that special occasion, why not import your favourite photograph? Print it out onto transfer paper, and finally iron it on to your T-shirt – it couldn’t be easier! Personalise your clothing and express yourself to the world! Step-by-step wizard to help you lay out your T-shirt designs. Add graphic objects including logos, shapes, frames, effects and Text Art to your design. A “Quick Edit” function - including red eye reduction and scratch removal to get your photos to look their best. Mirror printing technology allows your design to be printed in reverse onto transfer paper*, then ironed onto your T-shirt. Print designs on T-shirts, bed linen, bags, aprons, hats, cushions...... in fact just about anything! Available separately.